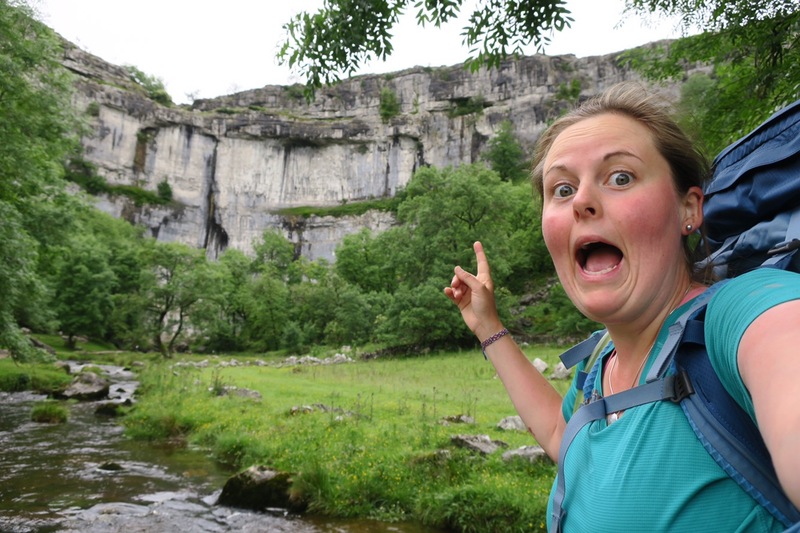 I left promptly as I knew I had a long day ahead of me and was looking forward to getting to the picturesque village of Malham and a night in the youth hostel. Soon after rising out of Cowling the drizzle began but I reached Lothersdale in good time. Unfortunately I was too early for the nice looking pub – it was only 10am! So I continued on climbing upwards; deeper into the cloud. 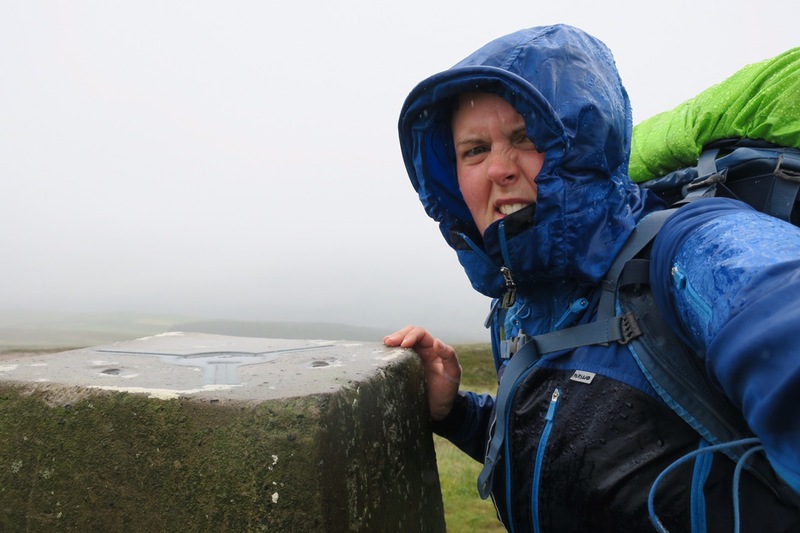 Reached Pinhaw Beacon and enjoyed the spectacular view – not! By the time I got to Thornton-in-Craven I was pretty damp and my boots hard started to squelch. This village is crying out for a pub but unfortunately lacks one so a bench would have to suffice (during a brief pause in the rain) where I changed my socks. Just before reaching East Marton – and it’s pub! 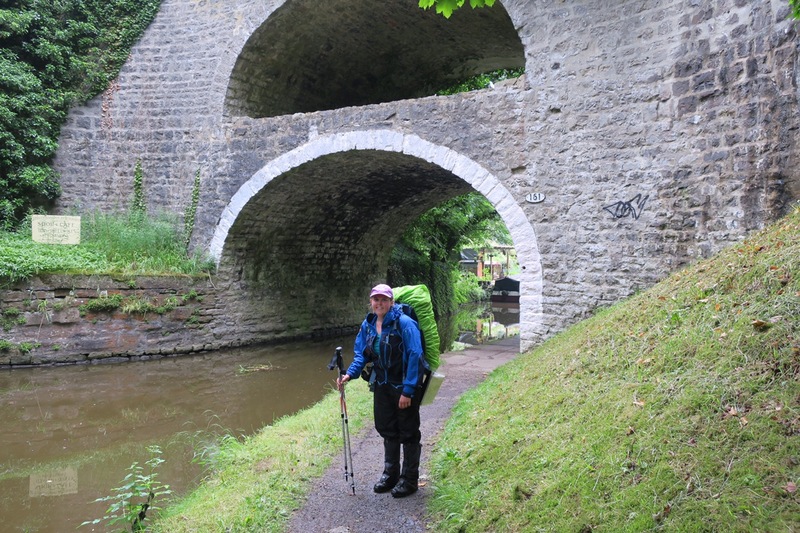 – there was a short stretch alongside the Liverpool to Leeds canal which included the double arch bridge. An odd feature that can’t be explained. Unfortunately the pub lacked a fire or warm radiator – it was actually almost chilly inside – but what it lacked in warmth it made up for with a delicious steak sandwich. Once I was mostly dry apart from my socks and boots I stepped back out into the rain and promptly slipped down the stone steps back onto the towpath. Luckily no damage done. On arriving in Gargrave and being presented with a tearoom I flexed my will power and managed to walk straight on by – there were still a lot of miles to go today. Conversation ensued for the remaining 6miles which made the time pass by much quicker and almost made me forget just how wet my feet were – sort of, although I think the squelching was audible. Walking over the crest of a hill and seeing Malham Cove looming in the distance, gave me a new appreciation of its sheer scale and uniqueness – that’s a moment I won’t forget. The hostel was rammed full of year 6 kids who had booked breakfast for 8am and so the vast majority of the hostel patrons were rushing to breakfast between 7:30 & 8:00. I saw Jane and Mark again and we swapped blog addresses before I departed. 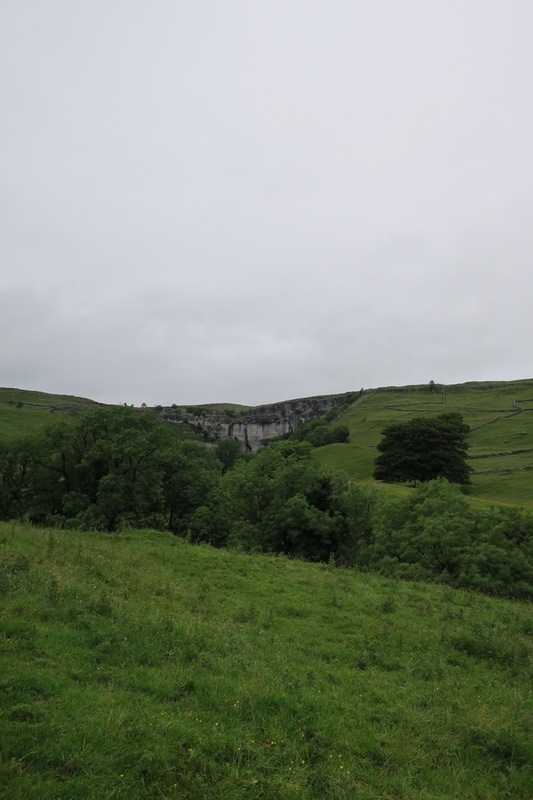 The first leg of the walk was to wander down to Malham Cove, climb the staircase and clamber across the limestone pavement at the top. Looking back I could see others starting to trickle out of Malham but as it was still relatively early I was alone on the top, that was until Connor’s head popped up from the last step. I couldn’t understand where he’d come from but it was nice to have some company again. 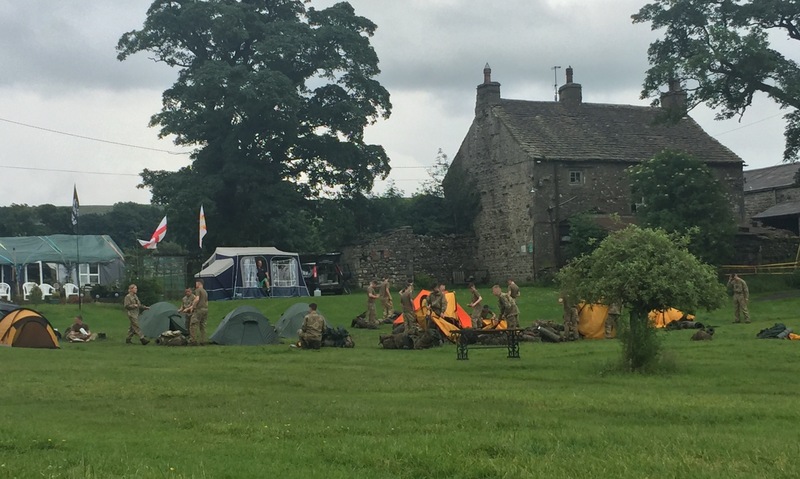 When I poked my head out of the tent in the morning all the cadets had packed up and gone without making enough sound to rouse me – couldn’t believe it! Without much in the way of food and with the well known Pen-y-ghent cafe / tourist information / shop / Yorkshire three peaks challenge check in/out post en route I decided to head there for breakfast. And who should I find waiting outside for it to open…Connor! 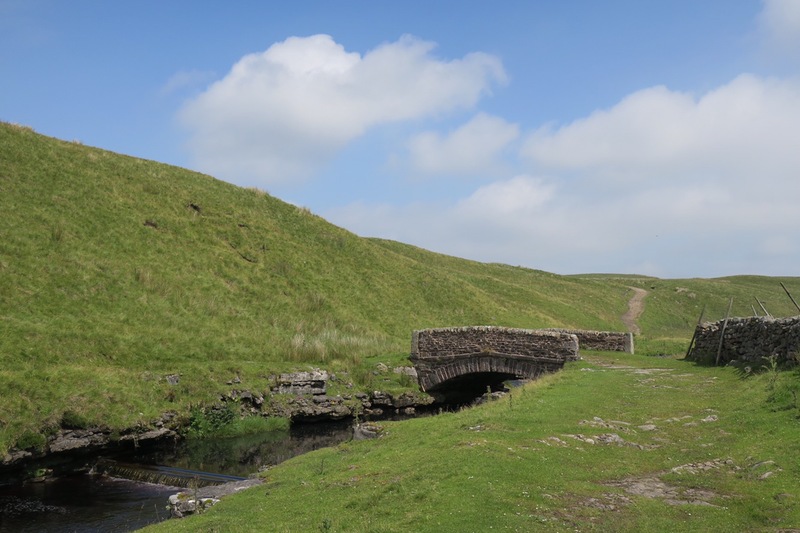 After I’d watched him drink a pint of hot chocolate – none of this grande, venti nonsense, it was small or a pint when it came to hot drinks – we set off for Hawes. Today’s walking was fairly unremarkable as it was along old packhorse ways – gradually uphill for the morning and then downhill for the afternoon. However what was remarkable was that at some point in the day I passed the halfway point! 600miles down, 600 to go. When I realised this I was on Birkwith Moor which unfortunately lacked a champagne bar so I merely stopped, through my arms aloft, whooped and then continued. The second half of the day we were a group of 4 – we had caught up with Jasper and Max. Once in Hawes I was celebrating reaching the halfway point with a pint outside one of the many many public houses on offer when Jane and Mark walked by. They joined me and even bought me a drink, and we shared stories of our walking experiences. 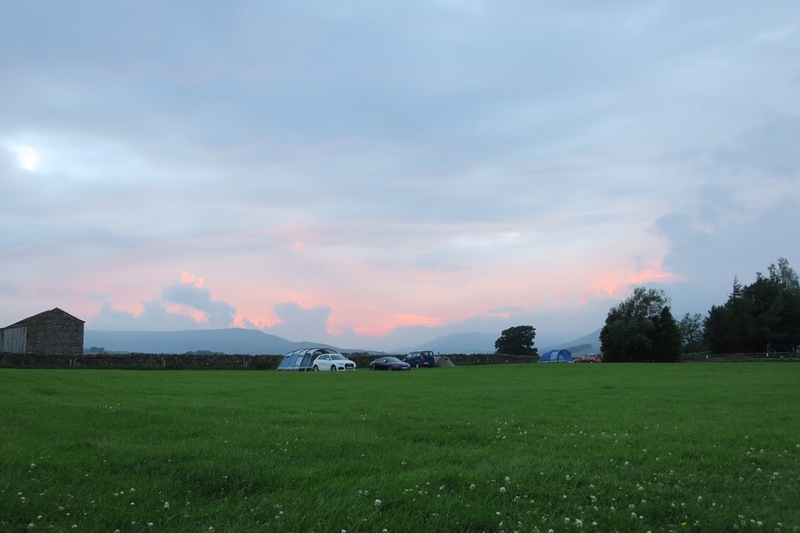 The campsite was 1km out of Hawes so I had to drag myself away from the pub and go and get my tent set up and dinner cooked etc. The following day was to be a rest day – eating lots of cheese courtesy of the Wensleydale cheese factory and waiting. Waiting for what? Well the Rockhoppers (the mountaineering club of which I am a member) just happen to have a trip booked on the same weekend in the same valley, just 10miles from me. So I’d arranged to meet with them for the weekend and do some more walking – in a circle for a change. I must be mad!